It&apos;s often the little things that make a difference. 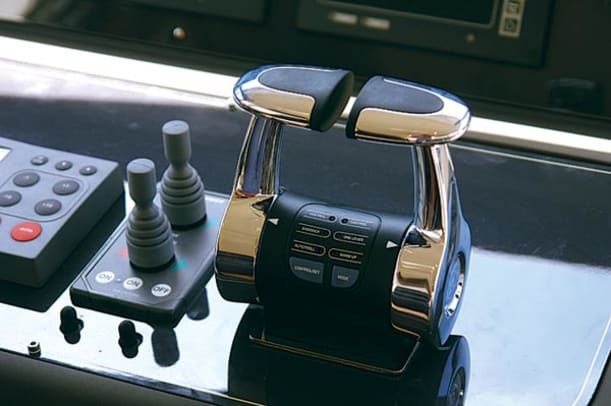 I&apos;m not suggesting that your decision to buy a $3 million yacht might rest on a particularly cool design of a door handle or whether the flecks of color in a granite worktop happen to match your socks, but it never ceases to surprise me how something seemingly unimportant can color my entire impression of a boat. 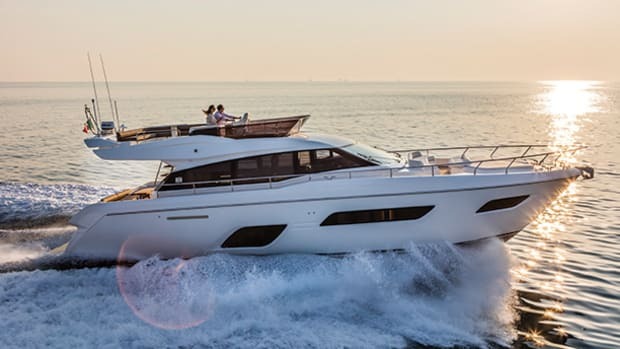 With Ferretti&apos;s new 630, it was the position of the galley. This is not normally something I have strong views about. I can see the benefits of putting the galley amidships, sociably in the center of things, but I can also appreciate the view if it has been sited down below. Both options are fine with me, and I really don&apos;t mind which side it&apos;s on. If the choice between one boat and another really came down to where the galley was, then it probably wouldn&apos;t be me doing the choosing. But on the 630 I was already in the middle of the saloon, having admired the dining area on the starboard side (which is served by an L-shape sofa and three upholstered steel chairs), sized up the helm station, with its single seat and compact yet workable dash layout, and mentally counted the number of people that the big U-shape sofa could comfortably accommodate (I reckoned about six, easily). I had even looked around to check out that slender set of see-through flying-bridge steps, before I realized that the galley just wasn&apos;t there—or at least it wasn&apos;t in any of the places I was expecting to find it. Somehow, after leaving my deck shoes in the cockpit and strolling inside (secretly congratulating myself on remembering to wear socks without holes), I managed to miss the galley completely. There it was, right by the door. This is what I mean about little things making a difference. Putting the galley right aft like that might seem a little thing, but boy—what a difference. It&apos;s on a corner, and although not particularly large, it&apos;s extremely versatile. 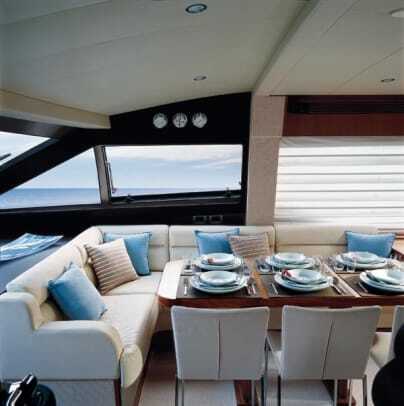 Thanks to the combination of a sliding internal screen and the hinged-glass bulkhead, it can face aft, beach-bar style, or sideways into the saloon. It can face both at the same time or be closed off completely. Meanwhile, on the outboard side, the chef has a great big window to look out of, too. The effect elsewhere on the main deck is to open it up, creating a system of interlinked central spaces that work easily together. At the same time it helps provide a sense of intimacy, which is often lacking in layouts where the main seating area is aft, open to the gaze of passersby on the quayside. How ironic that we were in Monaco, where posing for the benefit of quayside passersby is virtually a national sport. 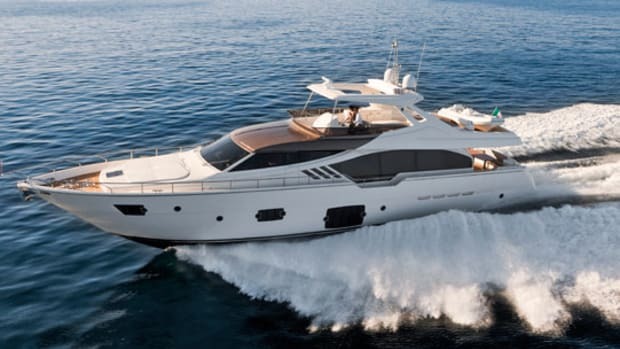 Down below, Ferretti has resisted the temptation to go for a fourth cabin, which is always of marginal benefit in a yacht this size. 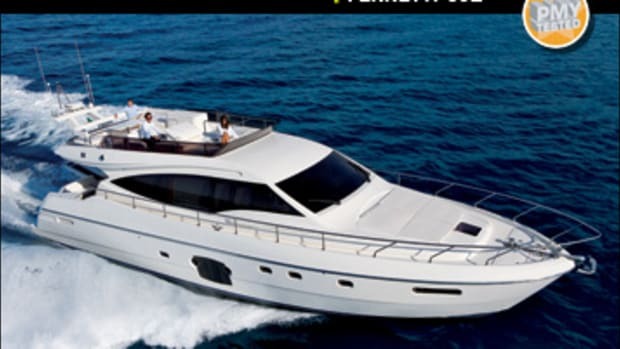 Instead, the sleeping areas have all been given plenty of room to breathe, especially the amidships owner&apos;s suite and the forepeak VIP double cabin. The huge windows in the topsides, each with an inset pair of opening portholes, let in so much light that the amidships cabin feels more like a penthouse than a waterside apartment. Headroom down here is around 6&apos;5", and there is plenty of stowage space—including a particularly large hanging locker—as well as an excellent, roomy head. The dresser is a couple of sizes larger than you&apos;d expect, too. 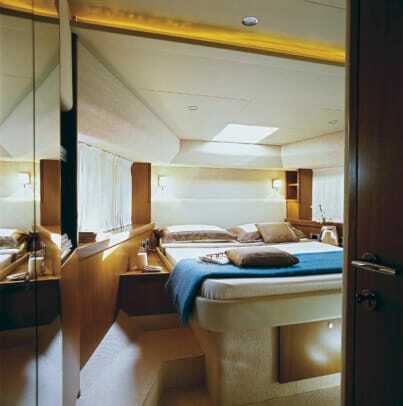 Access to the VIP cabin is unusual, the door leads to port instead of straight ahead, but once inside you can see that this has quite cleverly freed up floor space at the foot of the bed. There is a pair of adjacent hanging lockers on the port side, behind mirrored doors, and a seriously large drawer under the berth. The twin-berth guest cabin is the least convincing. By some margin the smallest and simplest, it is also the most poorly provided with stowage, although it would be ideal for children. The head here is the smallest onboard, its semi-en suite access leading you back out into the corridor via the shower compartment—a little strange, but the basic layout works fine. 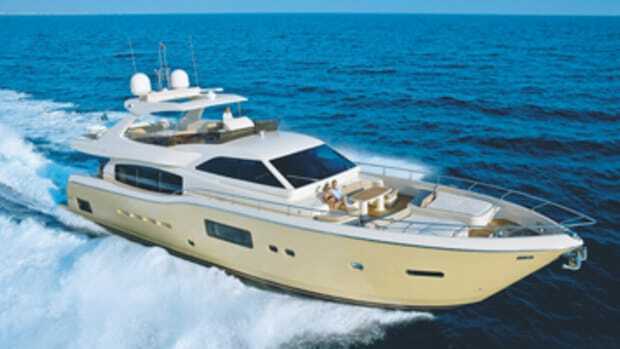 The 630&apos;s engines are connected to V-drive gearboxes and therefore set well aft, which allows the crew quarters—a quite acceptable twin-bunk cabin with a separate shower and head compartment—to be installed between the engines and the owner&apos;s stateroom. So not only is there great sound insulation between the accommodation spaces and the engine room, but engine access is a breeze, too, through a simple large hatch in the cockpit sole. 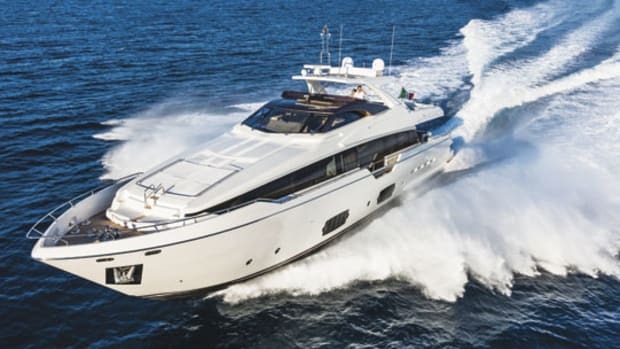 Along with its high standards of interior fit-out, Ferretti has a well-deserved reputation for engineering excellence, and the 630&apos;s machinery space upholds the company traditions admirably. The genset, watermaker, and air conditioning are all mounted forward of the engines, the batteries are outboard on the port side, pumps are outboard to starboard, and the fuel tanks are along the forward engine room bulkhead. The engines themselves are almost level, thanks to down-angle gearboxes, and this helps to make the engine room seem more spacious. But V-drives also mean that there&apos;s no room for a tender garage, although with stowage under the swim platform for a PWC and on top of the platform for a 12-foot RIB, both served by a hydraulic passarelle hoist, you&apos;re probably not going to miss it. 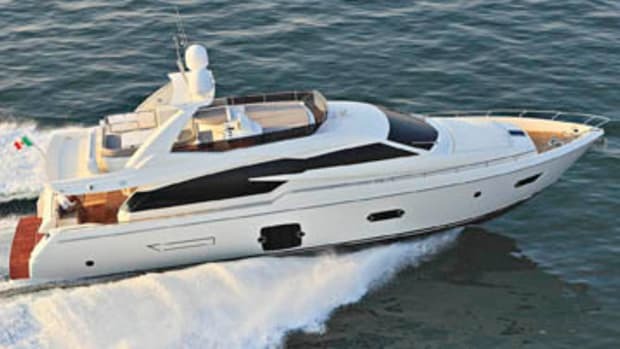 Two powerplants are offered, my test boat packing the larger 1,224-hp MAN common-rail V12s. 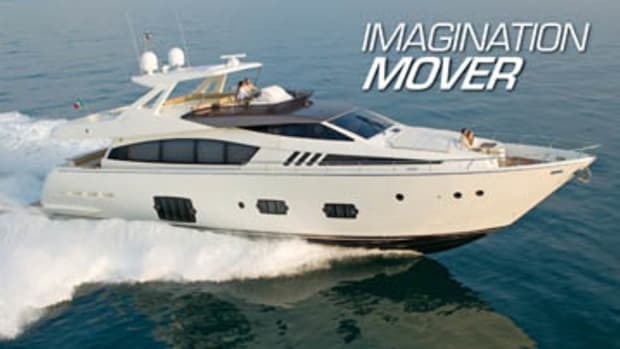 The 630 hull has prop tunnels: Ferretti says they&apos;re there to minimize the transitional hump between displacement and planing speeds, which is true—they do so by flattening out the shaft angle, directing thrust aft rather than down, and as a measure of how effective they are, take a look at our acceleration curve. Any 40-tonner that manages zero to 30 knots (34.5 mph) in a little more than 30 seconds is, basically, a flyer. But the other thing tunnels do, of course, is increase directional stability by exaggerating the effect of the keel. So although the 630 was never likely to have a problem getting up on plane—she packs nearly 2,500 hp, after all, and deadrise aft is a pretty minimal 12 degrees—she does indeed have an expansive turning circle. There was no suggestion of rudder stall, but she won&apos;t win any prizes in the slalom, and you certainly wouldn&apos;t want to keep going back for stuff—a 180 takes about 900 feet. Still, it&apos;s an eccentric owner who enters a boat like this for ski racing. What she&apos;s really about is luxury cruising. 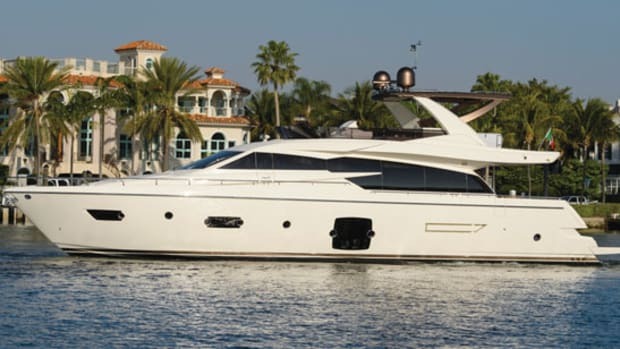 With a 300-mile range at 25 knots (nearly 29 mph), seriously practical tender-handling arrangements, and comfortable appointments from flying bridge to forepeak, she fulfills the brief admirably. 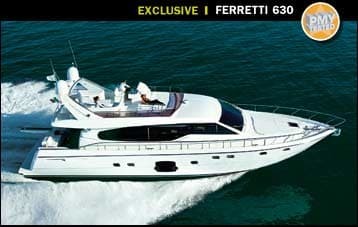 For me, however, the Ferretti 630 will always be the boat with the great aft galley. And I&apos;m not even that much of a cook. Inox steel bimini; mirrored cockpit windows; 31.7-gal Idromar watermaker; black marble in galley; 132-lb. 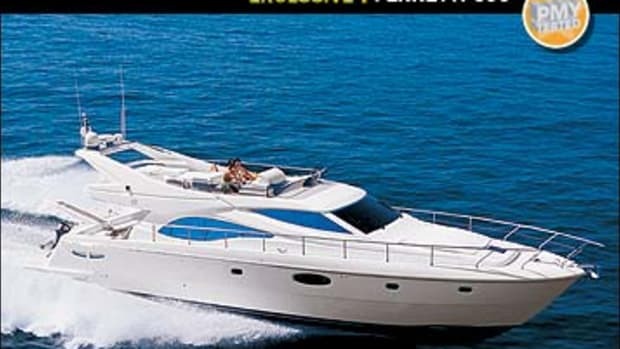 Bruce anchor; ice maker; external speakers; 32" LCD TV in saloon with electric lift; 26" TV in owner&apos;s cabin; electric grill on flying bridge; Navisystem 65NT TV & satellite antenna; 10.7-hp Side-Power stern thruster; electric massager in owner&apos;s chaise lounge.